This tutorial explains how to use Goal Seek in Excel. It includes explanation of this feature with several practical examples. Goal Seek is an inbuilt excel utility that solves an equation and helps you to answer this question "What would be the input value to get the desired result". The following are the steps to prepare data before running Goal Seek. Type the text 'No. 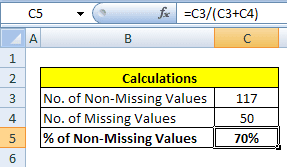 of Non-Missing Values' in cell B3 and enter any dummy value (let's say 117) corresponding to it in cell C3. We'll calculate the exact value in the following steps. Enter the text 'No. 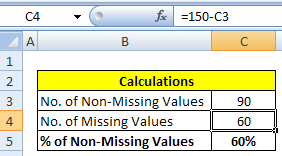 of Missing Values' in cell B4 and the actual figure (let's say 50) in cell C4. 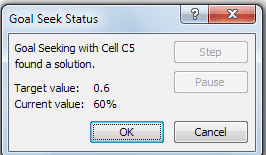 Type '% of Non-Missing Values' in cell B5 and enter the following formula in cell C5. Go to the 'Data' tab and click on 'What-If Analysis' button and select Goal Seek under it. See and follow the instructions shown in the image above. Q. What would be the number of non-missing values if we want to get 60% of non-missing values? Set cell : Cell reference wherein formula is entered. In this case, give cell reference of C5. 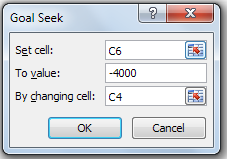 By changing cell : reference to the cell that has the value you want to change. In this example, it is reference of cell C3. Solution : We require total 75 non-missing values to have 60% non-missing percentage. How can we do it without Goal Seek? If you enter equation of step IV in the formula =(C4*0.6)/(1-0.6), it would return a desired value. Is the above solution correct? Answer is NO. It is because the number of missing values are dependent on non-missing values. Both makes a complete dataset. For example, you have a data set which comprises of total 150 records. If you fill 15 missing records to some value, it would increase the number of non-missing records by 15 and the number of missing records would accordingly fall by 15 records. To workaround this issue, we need to include total number of records as a constraint. See the solution below. Since we have assumed 150 total number of rows/records in the dataset, we can set this constraint in the formula. In this case, it returns a solution which also considers the number of cases in data and make sure it's always equal to 150. 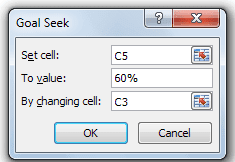 The cell reference in Set cell: box must contain a formula. Otherwise, it would return an error. You cannot give cell reference in 'To value:' box. You need to enter a value. The cell reference in 'By changing cell:' cannot contain a formula. It must be a typed value. Suppose you want to buy a luxury car which costs $150,000. To finance it, you take out a car loan from a bank for $150,00 at 14% interest rate. You can pay maximum $4,000 per month in instalment. You need to figure out how many periods you need to pay monthly payment? 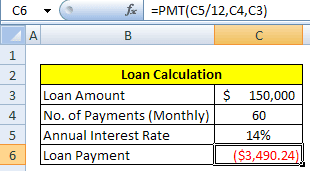 You can use PMT() function to calculate the payment for a loan. In this case, we need to calculate 'No. of Payments' which is a parameter in the function itself. Enter figures of Loan Amount, No. of Payments (Monthly) and Annual Interest Rate from cell C3 through C5. Put any dummy value against No. of Payments. We'll calculate the correct value later. In Set cell:, enter reference of cell C6. In To value:, enter -4000. Make sure it is negative since it is a payment. Solution : Goal Seek found the solution and it is required to pay 50 monthly payments when $4000 is paid monthly in installment. Goal Seek is very helpful for quickly solving any financial and statistical formula for a single unknown value. It saves a lot of time when it is difficult to derive a formula to calculate unknown value. As shown in the second case study, it takes time to transform equation of loan payment and calculate the terms without using Goal Seek. If you have a complex problem which contains multiple equations and multiple constraints and you are asked to find the optimal solution, you should look for Excel's Solver Add-In instead of Goal Seek. Excel Solver is a powerful method to solve optimization problem. 1 Response to "Excel : Goal Seek"